How better to mark the birthday of Scotland’s national poet, Robert Burns, than with a Good Scotch Haggis! Burns famously penned an Address to a Haggis, an ode to the ‘great chieftain o’ the pudding race’, which first appeared in print in the Caledonian Mercury of 20 December 1786. 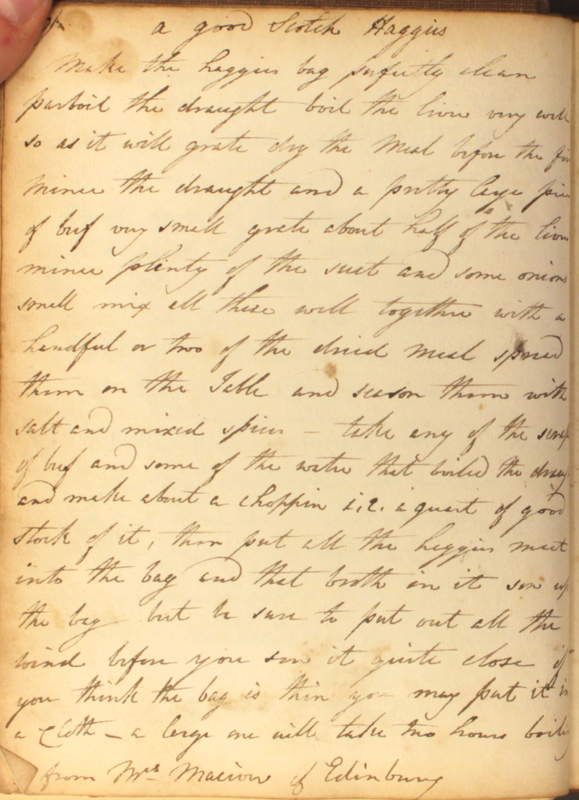 This recipe was copied into our Georgian Cookbook from The Cook’s Oracle by Dr William Kitchener, who in turn had taken it from Mrs Maciver, a cookery school teacher in late 18th century Edinburgh. Susannah Maciver was practising her art of cookery around the time when Burns was immortalising the hearty haggis in poetry. Make the haggis bag perfectly clean. Parboil the draught. Boil the liver very well so as it will grate. Dry the meal before the fire. Mince the draught and a pretty large piece of beef very small. Grate about half of the liver. Mince plenty of the suet and some onions small. Mix all these well together with a handful or two of the dried meal. Spread them on the table and season them with salt and mixed spices. Take any of the scraps of beef and some of the water that boiled the draught and make about a choppin (sic.) a quart of good stock of it. Then put all the haggis meat into the bag and that broth in it. Sew up the bag, but be sure to put out all the wind before you sew it quite close. If you think the bag is thin, you may put it in a cloth. A large one will take two hours boiling. From Mrs Maciver of Edinburgh. The title of this dish is a little misleading. It might have you expecting a fine seafood dish, but rather than scallops these are in fact ‘Scotch Collops’: thinly sliced veal in a rich gravy. The term ‘collop’ is thought to derive from the French escalope and essentially means the same thing: a boneless slice of meat, which could be fried, broiled or stewed. This Scottish variation offers a rich winter treat, but wouldn’t be cheap to make today: the recipe calls for both oysters and truffles. There’s another ingredient which is rarely seen today: the recipe instructs that, should a heifer calf be used for the veal meat, then the udder should be cut up finely ‘like coxcombs’ and fried up as a garnish for the dish! Take a leg of veal. Cut of as thin as possible, ye round way, as much scollops as will fit yr dish, & beat them with [a] rowling pin. Strowe them all over with flower, then put an ounce and half of butter in ye pan & when it is hot, lay in the meat & lay ye same quantity of butter over it. Then cover them with a plate & let them stew till all ye liquor is consumed & ye are a fine light brown. 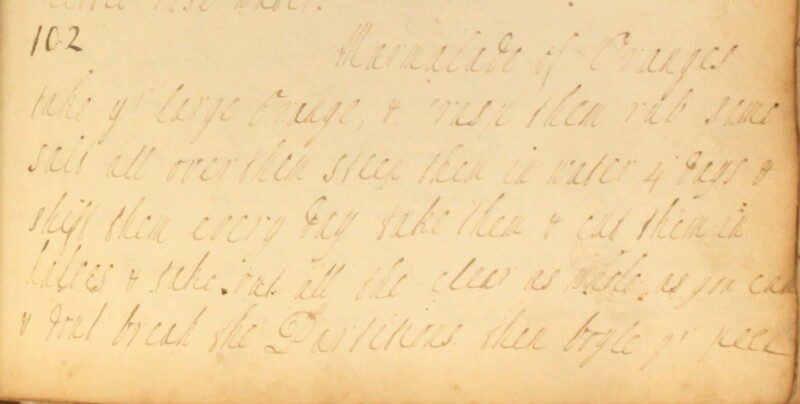 Then put a pint & half of good brown greavy & half a pint of white wine, some thyme & parsley, two anchovys, two onions shred, half a nuttmeg grated, half an hundred of large oysters, some lemon peel, ye juice of a lemon, some morells & troafels that have been first soaked in water. Stew all till you think they are done, then toss them up with a lump of butter rolld in flower till ye sauce is pretty thick & sticks to ye meat. If you cant get morrels and troafels, dried mushroons will do. Put in some roasted chessnuts. If heifer veal, slice ye udder thin like coxcombs. You may lard them if you like it better then plain. Garnish with some slic’d lemon, fryed bacon and forsd balls. We know what you’re thinking… what on Earth is a skirret?! Sium sisarum, commonly known as skirret, is a root vegetable in the Umbelliferae family of plants. The skirret plant grows clusters of long, knobbly, edible roots, which can grow up to a metre or so in length. Each individual root looks a little like a parsnip or carrot in appearance and, when cooked, has a firm texture and a sweet, nutty taste. Although almost unheard of in British supermarkets today, the skirret is surprisingly easy to grow. It is a perennial plant and is resistant to cold as well as to many pests. It is therefore little wonder that the skirret was a staple food in Medieval Britain. Following the introduction of the potato to the British diet in the late 16th century, the popularity of skirret declined. By the early 1700s skirrets were being used less widely and by the turn of the 19th century they had disappeared from most recipe books altogether. 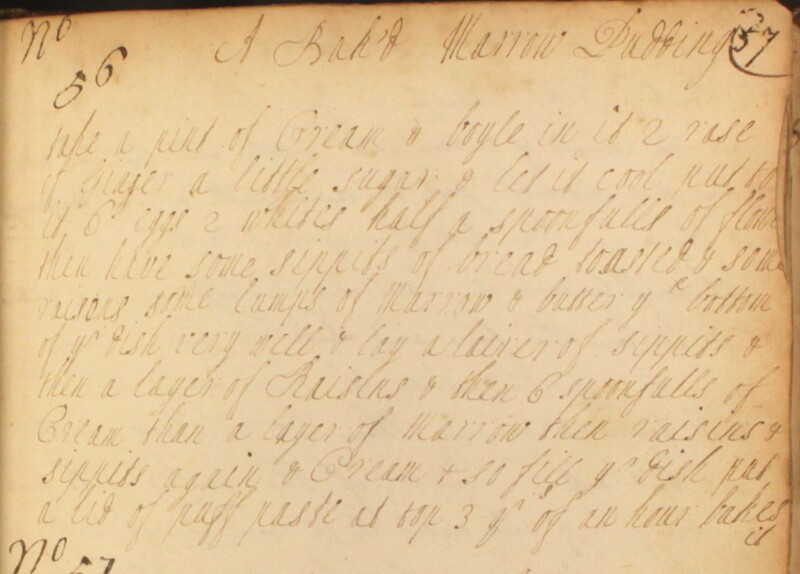 Our Cookbook of Unknown Ladies suggests just one dish using the vegetable: skirret pie. Take the largest skirrets you can get & parboyle them & peel them & season them with cinnimon & powder sugar & put them in a dish with a good deal of fresh butter & some sliced citron & candid orange peel & candid eringoroot, 3 spoonfulls of rose water, 4 of white wine, some Jerusalem hartichokes boyled & sliced. Make it with cold butter paste. When it coms out of the oven, have ready a caudle made of half a pint of sack, some sugar & nutmeg & the yolks of 4 eggs & a print of butter poured on it very hot & the lid laid on it again. There’s a fantastic article about skirrets in the Food History Jottings blog, complete with photos of an impressive reconstruction of a 17th century skirret pie. Well worth a look! If you have any cranberries left over from Christmas Day, this recipe for a ‘bog berry’ pudding offers a tasty way of using them up! 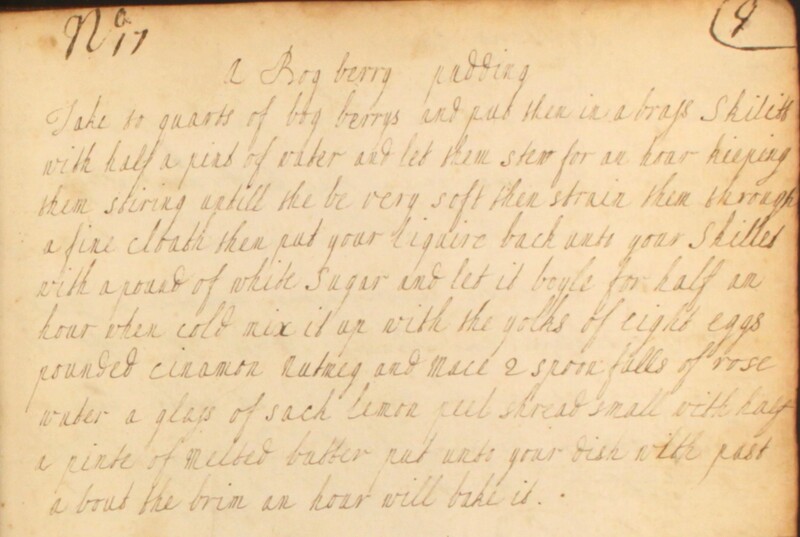 This 18th century recipe is a great way to use up your Christmas leftovers: for ‘bog berries’, use cranberries. Take to quarts of bog berrys and put them in a brass skilett with half a pint of water and let them stew for an hour kieping them stiring untill the be very soft. Then strain them through a fine cloath. Then put your liquire back unto your skillet with a pound of white sugar and let it boyle for half an hour. When cold, mix it up with the yolks of eight eggs, pounded cinnamon, nutmeg and mace, 2 spoonfulls of rose water, a glass of sack, lemon peel shread small with half a pinte of melted butter. Put unto your dish, with past about the brim. An hour will bake it.